Siemens Industry, Inc helps industrial, manufacturing and construction sectors succeed by providing complete electrical and automation solutions. Through a commitment to innovative engineering that goes back more than 150 years, they serve the world’s largest and most respected companies through integrated solutions, software and hardware. IBT Industrial Solutions is a major distributor of Siemens electrical products, offering every component from a full system down to the coupling. 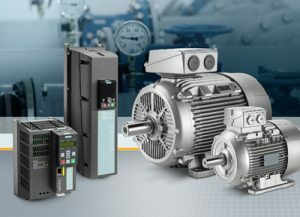 Siemens’ large product offering and a multitude of product lines encompass everything from Automatic Systems and Controls to VFDs, Electric Motors, Gearboxes and much more. When you partner with IBT, we take pride in helping you identify the right combination of products, services and solutions to meet your specific application needs. SIMOTICS industrial electric motors provide you with the optimum solution for every application. Backed by 150 years of experience, SIMOTICS motors are unrivaled when it comes to reliability, ruggedness, compactness, efficiency and performance. When it comes to the Internet of Things (IoT), automation products have been able to give manufacturers advanced communications capabilities to keep up with new demands to collect information. Siemens control products provide components that do exactly that. Additionally, their control products communicate at the smallest device, a pushbutton, for complete system digitalization over a new or existing network for total transparency. It’s “out of the box” ready to communicate with AS-Interface, IO-Link, PROFINET, and other networks providing the monitoring and diagnostics that are needed throughout the entire supply chain. Siemens has the variable frequency drives to address the complete power conversion spectrum – the entire “drive train” – maximizing energy efficiency and productivity improvements. Integrated products include variable frequency low voltage motor drives (electric inverters), medium voltage drives, and DC drives. Far more than just products, Siemens offers value-add services, such as mechatronic support and web-based preventive maintenance. The high-quality industrial couplings are very well suitable for the use in many fields of application, many of them even in potentially explosive atmospheres. The product range covers couplings of a torque range from 10 up to 10,000,000 Nm. FLENDER couplings stand for highest reliability, low maintenance, and low investment and lifecycle costs. Even as individually adapted solutions, they are convincing because of their highest product quality and long service life. Siemens serves the entire product, system and solution business for the power distribution infrastructure of residential, commercial, industrial and utility markets. The division offers a wide-ranging portfolio of power distribution and circuit protection products, covering the range from 120 V to 38 kV. It includes circuit breakers, switches and MV motor controls as well as switchboards, switchgear, busway, power panels and standby power products. The division’s protection and control offering encompasses power monitoring systems, electronic circuit protection, distribution automation and Smart-Gear(R) – Power Distribution Solution. Additionally, the division supplies energy-efficient solutions for the integration of renewable energy and electric vehicles. IBT Industrial Solutions and Siemens Industry, Inc are uniquely positioned to help your organization achieve goals faster, smarter and more cost-effective than ever.